Clair Leverett Peck IV, a senior and Seabury's student body president, is a fun and original person to be around. He laughs a lot, sees everything in an optimistic way, and inspires others to try their best. Before Peck attended Seabury Hall, he was a student at Haleakala Waldorf. His favorite subject is Social Studies because he tries to relate past events into his everyday life. Peck co-leads a few clubs at Seabury, such as TEDx, Best Buddies and more. Peck describes his family as being an eccentric, great mess. He has an older sister and a younger brother; he gets along very well with both of them and considers them to be great friends. If you were to take a tour of his house, you would find two pigs, three dogs, and a handful of ducks and chickens. In his spare time, Peck enjoys cooking simple recipes, paddling, taking photos and videos, and designing pottery. The reason Peck is taking Journalism this semester is because he loves telling stories. 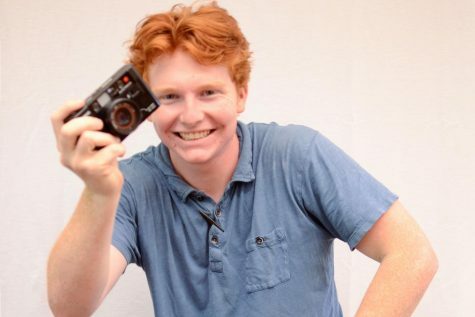 One of his dreams is to one day incorporate film into Journalism and travel around the world. Peck looks up to film director Wes Anderson because he loves his work and would love to someday go to film school. Something that makes Peck angry is when people give up easily and don’t believe in themselves. This reflects upon his strong, confident, and persevering personality.